Want to dive in Phuket or the Similan Islands? You can contact me at Sunrise Divers! I came to Phuket in 1999, not with any plan to stay forever, get married and raise a family, but simply to find work as a scuba diving instructor and "give Thailand a try" with a vague plan to move on to other SE Asian countries and try them as well. 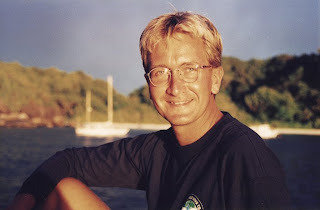 I had done my divemaster course back in 1996 in Utila (Honduras) and gone back there in 1998 to become an instructor, with half a mind to stay on that little island forever. But quite a few instructors I knew there had worked in Thailand and it sounded interesting so after about 18 months on Utila, I came to Thailand. I came to Phuket first because my reading on the internet led me to believe that the best diving in Thailand would be at the Similan islands. So I wandered around Patong looking for work, got some work teaching, did a couple of trips to Burma, and then got a job on a liveaboard in the Similan Islands. From the first dive, I was a happy diver! Plans to maybe move on somewhere else were abandoned. Sunrise Divers in 2001 was a little shop on the main road about 200m from Karon Beach. Not a busy shop, but when I started working in October 2001 I was fairly busy teaching dive courses, doing the occasional liveaboard to the Similan Islands or overnight trip to Phi Phi, or otherwise taking the office chair. Quite busy in high season, but hardly any business in low season. So we started doing some major work on our website. New design, lots of optimisation, I read a lot of articles and web forums on how to get a better Google ranking. Keywords, titles, h1 tags, links, is this the life of a dive instructor?! But hey, it kept me busy for low season and it worked - our website rose up the Google searches and suddenly we had emails to answer, quite a lot of emails. And a large number of the mails were requesting liveaboards to the Similan Islands. We moved to a much larger dive shop in 2004, with 3 floors, aircon office, aircon classroom, large equipment room... we bought more dive gear and now have more than 25 sets, all kept very well serviced. Sunrise Divers is a PADI 5 star center, and we joined the local recompression chamber network. It was around 2003 that people really started to book things online, and email became normal for communication. Before that it was much more normal to just show up in Phuket and go looking for a dive shop. We've made several redesigns of our website since 2003, the latest features a big "back office" (database) for liveaboards. I still look after the website, and since a few years ago I stay full time in the dive shop. These days, everyone expects fast replies to emails and most people who have booked online will come to the shop looking for Jamie. Our dive shop is still in Karon (map), a bit off the main road in a little square called Karon Place next door to a hotel of the same name. Some big hotels like the Orchid, Hilton and Thavorn Palm Beach are a few minutes walk away, and there are many smaller hotels and guesthouses in the area. The south end of Karon Beach is also good for snorkeling and even for diving. Sunrise Divers is open year round - we might close a few days here and there such as Songkran or Christmas, and maybe on the odd day in low season due to holidays, but you can dive in Phuket year round at local dive sites, so we stay open. The best diving of course is to be done by liveaboard. 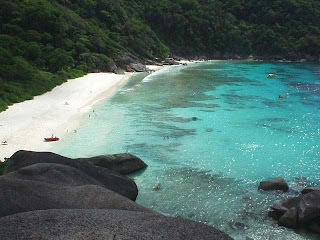 The Similan Islands National Park is open only from November to early May. Liveaboards can be as short as 2 days, or as long as 10 days. The average is a 4 day trip which will dive at the Similan islands, Koh Bon, Koh Tachai and Richelieu Rock. Some longer trips also dive in Burma. Liveaboards are GREAT! Wake in the morning, coffee, briefing, gear on and wake up on your first dive! Whether you are an experienced diver, a new diver, need a refresher or want more dive training, come and see me at Sunrise Divers. There are liveaboards to suit all budgets, day trips to many different dive sites, or we can teach you to dive.. I won't be the instructor though, I have not done any teaching for about 4 years.. too busy tapping away on the keyboard! Below are a bunch of links to the Sunrise Divers website for a lot more information that I can provide on a blog post. Hope to see you or get an email (info@sunrise-divers.com) from you soon! Sunrise Divers - Diving Phuket, the Similan islands and more!